Extended Series Desiccant Breathers - Lubrication UK - UK distributors of Memolub lubrication systems manufacturers of single and multipoint automatic lubrication units. Secondary Filter Element – Second polyester filter element protects against migration of desiccant dust, providing maximum efficiency. Integrated Nylon Standpipe – The integrated standpipe provides excellent vibration resistance and dissipates impact throughout the unit, eliminating weak points. It also allows even airflow distribution throughout the unit, preventing inaccurate readings of desiccant saturation. 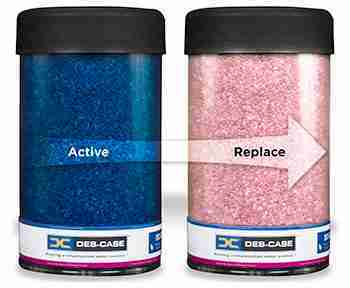 Water Vapour Adsorbent – Silica gel adsorbs water from incoming air and can hold up to 40% of its weight. Condition is indicated by change of colour from blue to light pink. Resilient Polycarbonate Body – Shock-absorbing, clear casing provides reliable service, easy visual maintenance, and UV resistance. Honeycomb Technology Oil Mist Reducer – The oil mist reducer is situated inside the standpipe, made from polypropylene for maximum chemical compatibility. Mimicking nature’s intricate honeycomb design, this feature allows oil mist to coalesce and drain back into the reservoir, rather than compromising the desiccant. Filter Element – Polyester filter element removes airborne contamination to 3-micron absolute. Unique loops allow particles to release during system exhalation, helping to increase breather life. 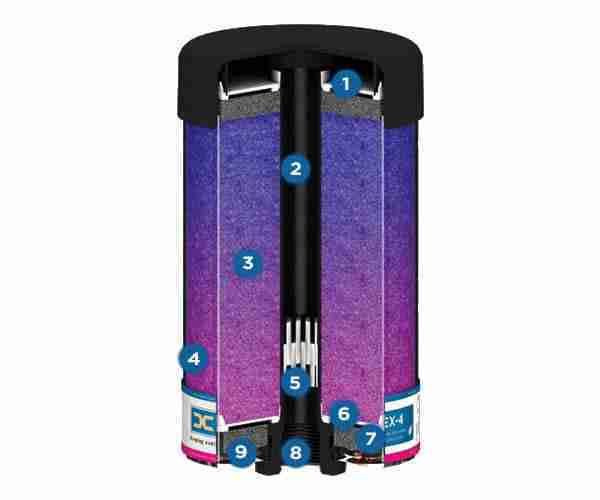 Foam Pad – Foam filter captures any oil mist and disperses incoming air evenly over filtration and drying areas. Thread Mounting – Internal threads provide durability and stability and can be used with one of several adapters. Six Check-Valves – High-quality umbrella check-valves that won’t clog or stick are located underneath the unit for added protection from washdown environments. Check-valves isolate equipment from ambient conditions prolonging breather life, and protecting system integrity. As wet, contaminated air is drawn through the unit, multiple 3-micron polyester filter elements remove solid particulate, and the colour-indicating silica gel extracts moisture. When air is expelled from the container, the top foam pad prevents oil mist from contacting silica gel or entering the atmosphere. Additionally, the breather is outfitted with a resilient nylon standpipe and polypropylene oil mist reducer to allow oil mist to coalesce and drain back into the reservoir, rather than compromising the desiccant. Six high-quality umbrella check-valves are located underneath the unit to isolate equipment from ambient conditions, prolonging breather life and protecting system integrity. Seeing pink? A pink breather means it has done its job keeping moisture out of your lubricants. Time to replace the breather with a new one.